California uses comparative fault. To illustrate this, let’s say a bicyclist was riding his bike in a crosswalk where he should have been walking the bike. At this point, the defendant may argue that he was 10, 15, or 20 percent at comparative fault for that accident. This would act as a reduction in the overall settlement. Thusly, if the case was valued at $10,000, and the bicyclist was found 20 percent comparative, then the $10,000 settlement would become an $8,000 settlement. Anything less than 51 percent would bar any recovery in other jurisdictions. However, in California, even if the defendant were 1 percent responsible, he would still be able to recover that 1 percent of the overall damages. In case of a significant injury, even a very small percentage could be a substantial sum of money. Are The Courts Or The Public Biased Against Bicycles Or Bicyclists? I have not noticed any bias toward bicycles. However, there does seem to be an inherent bias toward motorcyclists. I recently had a case in which the motorcyclist was sitting at a red light, minding his own business with his feet on the ground. He was rear-ended, but they still tried to argue some comparative on the motorcyclist. They argued that he was stopped in the middle of the lane. Thusly, he may have not been rear-ended if he had been offset to the right or left. For some reason, insurance companies always argue some sort of comparative fault on a motorcycle. People may look at motorcyclists differently than they look at the rest of the world. This might be because images of outlaw bikers are engrained in our minds. This could be because there are visions of motorcyclists splitting lanes, racing between cars, or doing something they should not be doing. Insurance companies play on these images, although I do not see that very often with bicycles. This only occurs when the bicycle is being ridden on the wrong side of the road, or being ridden on the sidewalk. Do Automobile Drivers, Truck Drivers, Or Motorcyclists Have A Typical Understanding Of How To Operate A Vehicle When Close To A Bicycle? The problem is that they do not have the experience dealing with bicycles because there are not a lot of bicycles on the road compared to cars. People are more conscious about looking for vehicles than for bicycles. Bicycles have the ability to move quickly in and out of traffic. They can cross crosswalks quickly and navigate quickly.They do not have the size that would draw the attention of a motorist during the same action. In this regard, a bicycle is a little more dangerous than a pedestrian. It moves quicker, and it can get itself in the way of danger a lot faster than a pedestrian could. How Would The Case Be Handled If A Bicycle Was In An Accident With An 18-Wheeler? The case would be no different in terms of the liability, because the same legal principles would apply. However, the injury could be substantially more significant. It would be very similar from a legal perspective because the same rules of the road and vehicle codes would apply. However, the damages could be a lot more significant. There was an accident in which the bicyclist was standing with his bicycle on a corner and waiting for the light to change so he could cross the street. At this point, a big 18-wheeler made a right turn. The rear axle of the trailer hopped over the curb and ran over the bicyclist, who was facing the other direction. The mechanisms of the accident could be a little different. There is a potential for more risk associated with a bigger accident based on the size and the mobility of the vehicle. What Could The Other Side Use Against The Victim Of A Bicycle Accident? A law in California states that the person should act like a car when he is riding a bicycle. This is what I always tell people when I am interviewing them on the phone or making the initial contact with somebody who had a bicycle accident. I always ask if they were acting like a car. Bicyclists need to abide by the vehicle code, and they need to go with the flow of traffic, honor traffic control devices like stop signs and turn signals, and signal when they are changing lanes. The number one rule is always to act like a car. The most common bicycle accident situation occurs when a bicycle goes against the flow of traffic. This occurs when it is being ridden in the gutter next to the curb. Thusly, a vehicle making a right turn could strike them. The driver of the vehicle would look left to check for oncoming traffic when he is preparing to make a right turn. He would not expect anybody to be coming in the opposite direction of travel. He would make his right turn, but it would cross the bicycle’s crossing path at the right side. Therefore, the bicycle would get hit in the curb lane going the wrong way. In that situation, the insurance company would argue that the bicycle rider was at fault for the accident. He was on the wrong side of the street, and he was going against the flow of traffic. This happens most often. Have You Dealt With Any Unique Bicycle Cases? There was a case recently in which the bicyclist was actually riding on the sidewalk. He shouldn’t have been doing this. However, he hit a drain grate on the threshold between the sidewalk and a private property parking lot. The drain grate had a break in it, and there was a section missing. The tire caught in the broken drain grate, and the rider sustained a fracture to his upper extremity when he fell. It was obviously a bicycle case, but it was also a premise liability case. It resulted from a defect on the property rather than another automobile. Often, I talk to people about other people who race bikes with the very thin tires. There are still areas in southern California on which roadways were constructed back in 60s or 70s. They actually still have a groove cut out at intersections to allow the water to run in. I’ve seen numerous situations in which tires have gotten caught in that groove, causing the rider to fall. 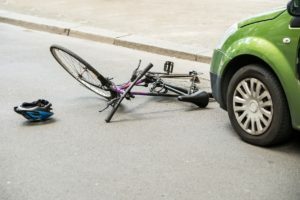 Sometimes, there can be a bicycle accident that is actually a premise liability claim due to some defect on the actual property, the sidewalk, the street, or the roadway. What Is The Most Difficult Aspect An Attorney Must Deal With? The most difficult would have to be the liability perspective. We must do certain things to try to preserve the highest percentage of liability on the defendant. This is especially true if the bicycle was doing something to violate the vehicle code or not acting like a car. For more information on Liability In a Bicycle Case, a free initial consultation is your next best step. Get the information and legal answers you’re seeking.